YHLHAP is such a fun podcast to listen to! My son just asked me, "Why do you listen to this podcast all the time?" Answer: because it's so good! We’ve got a really exciting announcement this week about a new home project we’re taking on, including how it came to be, what has us most excited, and why it’s gonna challenge us in big new ways (did we mention it’s out-of-state?). Also, we’re sharing how last week’s Spring Break trip reinforced our mission to minimize our belongings, even if John did bring home something very strange from the vacation. Plus, a new solution we’ve found for wrangling our digital photos, a new DIY tool that’s brilliantly simple, and… well… nutmeat? Be sure to check out younghouselove.com/podcast-137/ for notes, links, and photos from this episode. This week we’re talking to Joyful author and expert Ingrid Fetell Lee about some simple ways to inject joy into your home without breaking the bank. She also explains why joy is easier to achieve than happiness - and how seeking it at home can actually help you unlock your decor style. Plus Sherry marked her recent birthday by getting a long-awaited tattoo (actually, two of them!) so she’s explaining the meaning behind them, how much it hurt, and what finally convinced her to go for it. We also share our latest escape room attempt, how we’re battling car clutter, and a BIG change to the podcast that you won’t want to miss. Be sure to check out younghouselove.com/podcast-136/ for notes, links, and photos from this episode. If you think our podcast has tackled this question already, JUST YOU WAIT! The universe recently tested Sherry’s dollhouse fixation and whether she passed or failed it, well, may depend on who you ask. We also share what item Ikea was mysteriously selling in bulk - but only in America (we laughed out loud at the big reveal) and we hear from some listeners about how space makeovers can affect behavior in a fascinating way. Plus some interesting lessons someone learned when they challenged themselves to dress in only one color. And we talk about the always emotional topic of textured walls. Buckle your seatbelts. Be sure to check out younghouselove.com/podcast-135/ for notes, links, and photos from this episode. Today we’re sharing how to find the right balance when you’re choosing between artwork or family photos for certain walls - and we're revealing where we've subconsciously gravitated towards putting personal photos in our own home (and why we think that is!). We also have tips for how to personalize your walls beyond the usual smiling-at-the-camera snapshot. And we’ve officially gone shed crazy (like really, really shed crazy), and the silver lining that we discovered after a yearlong delay at the beach house that's saving us money and getting us excited for the summer. Plus John's finally jumping on the crystal train. Be sure to check out younghouselove.com/podcast-134/ for notes, links, and photos from this episode. Be sure to check out younghouselove.com/podcast-132/ for notes, links, and photos from this episode. We were both pretty shocked about the results of going completely without television for a while - especially Sherry. So today we're sharing what we learned, what was hard, and the side effects that even we didn’t see coming. Not to mention the big question of how it will impact our viewing habits moving forward. We also tried a new paint picking method to see if it could solve a wall color conundrum at the beach house. Plus, Sherry updates you on her “tooth jail” sentence and I bask in the nerdy glory of pairing paint with geography. Be sure to check out younghouselove.com/podcast-131/ for notes, links, and photos from this episode. Be sure to check out younghouselove.com/podcast-130/ for notes, links, and photos from this episode. House projects don’t always go smoothly. We’ve all been there (heck, we're there right now with the duplex renovation) so we’re sharing some new strategies that we've been relying on to keep our spirits up whenever a renovation feels overwhelming, gets delayed, or hits some other unexpected snag. We’re also discussing some upcoming bathroom trends (one of them shook Sherry to her very core). Plus we’re officially starting our no TV challenge. Be sure to check out younghouselove.com/podcast-129 for notes, links, and photos from this episode. Be sure to check out younghouselove.com/podcast-128/ for notes, links, and photos from this episode. This week we’re sharing a simple kitchen change that made it WAY more efficient for us (we’re kinda kicking ourselves for not doing it sooner). There's also an update on some duplex delivery drama and we’re sharing three specific tips for book lovers who actually want books on their shelves (as opposed to filling them with a ton of decorative objects). Plus, the new show on Netflix that's debatably as life-changing to us as Marie Kondo's (we LOVED it - and we also chat about Marie's show too). 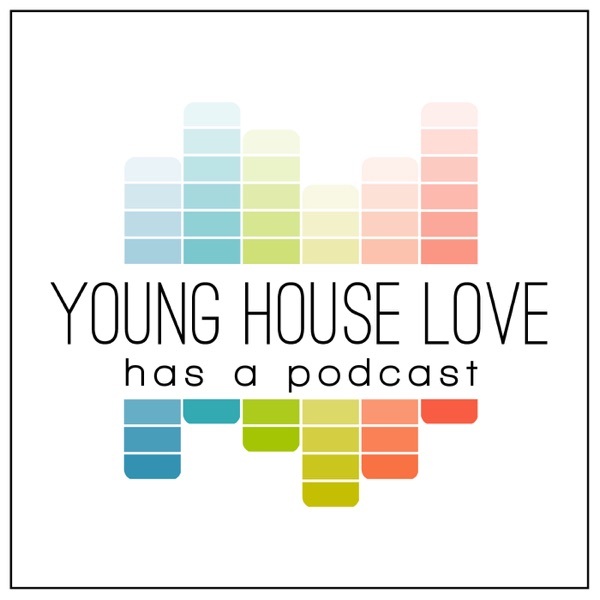 Be sure to check out younghouselove.com/podcast-127/ for notes, links, and photos from this episode. Lots of us want a more organized home, but are we going about it the wrong way? Today we’re talking with a home efficiency expert about how rethinking our approach to organizing could end up making us all happier - and maybe even turn us into more patient partners and more present parents. She also tells us why we should treat our kitchen like an operating room, how Sherry’s minimized closet could be better, and why garages are so hard to keep under control. We’re also sharing how a random phone call and a dicey forecast sucked the momentum right out of our duplex progress, but we’re still finding some silver lining in the news. Plus Sherry falls hard for some fairies. Be sure to check out younghouselove.com/podcast-126/ for notes, links, and photos from this episode. Our holiday was full of fun, family, and a freakish amount of Ikea boxes filling the duplex. So this week we’re sharing how we navigated the task of installing not one, but two kitchens over winter break - including how things got off to a rocky start - and when we actually saw the light (both literally and figuratively). We also got AN AVALANCHE of feedback from you guys on the small sleeping nook we debated filling with various bed layouts in our last episode, so today we’re sharing how we’ve adjusted our plans to make the room work for as many families as possible. Plus, we tried out a new money-saving trick (why haven't we been doing this for years?!) and requested some info from our international listeners that we hope leads to some interesting revelations. Be sure to check out younghouselove.com/podcast-125/ for notes, links, and photos from this episode. #123: Baskets: Friend or Foe? #102: Are Islands Ruining America's Kitchens? When you put a lot of time or money into a project, you’ll go to great, weird, and sometimes gross lengths to protect it. We’ve got all the details in this week’s episode, along with a story that shows why renovating a house that's over two hours away isn't always a smooth process. Plus, we gathered some great advice on building a new home from scratch (or tackling a major renovation with a group of pros), including how to find the right team and avoid common pitfalls... and why you should keep your expectations in check. Be sure to check out younghouselove.com/podcast-99/ for notes, links, and photos from this episode. A few years ago we embarked on a design project with a local company that we were very excited about… but it fell apart for reasons we could’ve never expected. We’re sharing that story this week, along with the surprising way Sherry scored an incredible secondhand find for the beach house. We also dive into your feedback about houses that are too big, including some conflicting sentiments about children and large houses. Also, how we pulled off a stress-free game night with friends and details behind our new collaboration with A Beautiful Mess. Be sure to check out younghouselove.com/podcast-98/ for notes, links, and photos from this episode. Our month-long shopping hiatus came to a close last week, so today we’re sharing our results! What was the most difficult part? How did it change our habits? What were we dying to buy first after it ended? And - most importantly - how did it impact our bank account? We’re sharing all those details, along with some ideas for you to try if you’re too nervous to commit to a full-on ban. Plus, there’s a part of our house that we rarely show because we’ve been so ashamed of its state - but not anymore! Find out what we did to fix it without spending any money. We also added some easy organization at the beach house… and those dreaded water meter issues came back to haunt us again. Be sure to check out younghouselove.com/podcast-97/ for notes, links, and photos from this episode. Right in the middle of our own month-long shopping ban, we jumped at the chance to have a deep conversation with the author who started it all: Cait Flanders. She shared fascinating insights, regrets, and explained how her “Year of Less” had a lasting change on her relationship with “stuff." She also cleared up some common misconceptions about her ban, including why shopping is not the enemy - and how this experiment affected her relationships (along with her bank account). We also cover how some outsourced work in our backyard from last fall is finally starting to pay off, and why we’re both very glad not to be in high school anymore. Be sure to check out younghouselove.com/podcast-96/ for notes, links, and photos from this episode. We’ve recently had a realization that we just don’t need as much space as we have. So how'd we end up buying a too-big house? What has made this so clear to us now? And what square footage do we think would be just right? We’re sharing all of that in this episode, including the exact moment we now realize we went off the rails during our house hunting search. We're also taking you behind the scenes of our recent charity makeover for three deserving kids and sharing why things have really turned a corner out at the beach. Plus, Sherry hunts for the perfect Mother’s Day gift and John shares what exterior gadget made all of our jaws drop. Really, it's mesmerizing to witness. Be sure to check out younghouselove.com/podcast-95/ for notes, links, and photos from this episode. Just when we thought the duplex renovation was finally rolling along smoothly, we found ourselves in the midst of an ordeal that required an emergency trip to Cape Charles, and another hot-seat meeting with the Historic Review Board. We're sharing all the details, along with an update on our month-long shopping ban (oh the temptations!). Plus we're talking about how to get large materials and furniture home when you don’t own a giant car or truck. Because as much as we DIY, we don’t actually own the ideal DIYers vehicle. So this week we'll tell you why, and share how we get around it. Plus, maybe millennials are just efficiently experts...? Be sure to check out younghouselove.com/podcast-94/ for notes, links, and photos from this episode. Can we go a whole month without buying anything we don’t need? That’s the challenge we’ve handed ourselves as part of a self-imposed month-long shopping ban. So this week we’re sharing how we were inspired by Cait Flanders’ “Year of Less” and how we’re adapting her rules for our own lives. Plus, the duplex renovation is (finally!) racing along and we’re answering some of your top questions about it. Also, how filming our April Fool’s video was even more embarrassing than it looked... and why a makeover show is giving Sherry hope that it might actually heal the world. Be sure to check out younghouselove.com/podcast-93/ for notes, links, and photos from this episode. Do you reject certain “household staples?” We do! And it turns out a lot of other people do too - to the point that experts are saying they might someday disappear. So this week we’re breaking down how and why the typical home (and its contents) might be changing, along with revealing what modern comforts we’ve deemed unnecessary in our house (one of them is weird, I'm warning you). We're also sharing how we found the best spring break home we've ever rented, and how we navigated the stresses of flying with children, car seats, a dog, his crate - essentially ALL THE THINGS. Oh, and it turns out we’re storing lots of stuff in our garage that we probably shouldn’t be. This week we're talking about when you should undo a personal or customized change that you made to your house that might turn off potential buyers (and when we'd recommend leaving it the heck alone). We're also getting into store returns and how they're changing, because the ability to return decor items that don’t turn out the way you hoped is a great safeguard... but did you know that some stores may be cracking down on that practice? Here's what we learned about the policing of returns that's going on behind the scenes, and what a DIYer can do to avoid getting their account flagged. We're also recapping our trip to a blogging conference in Austin, John has an a-ha moment regarding something you sleep on, and Sherry gets a personal call from a celebrity that kinda makes her year. Be sure to check out younghouselove.com/podcast-91/ for notes, links, and photos from this episode. We all know that deflated feeling when you’ve lost your mojo for a major project or renovation. So how do you reignite that excitement or energy you had for it in the first place? We’ve struggled with this at the beach house lately, so we’re sharing five tips for combating project fatigue. Plus spring is a big time for home maintenance, so we have an easy way to guarantee that you'll never forget about routine tasks again - plus a new trick for barreling through those other little lingering projects our your to-do list. We also share how we rediscovered a date night idea, and why we’re getting called out for fueling a despised decorating trend. Be sure to check out younghouselove.com/podcast-90/ for notes, links, and photos from this episode. Could you put your wallet on lockdown for 365 days? Sherry shared the story of a woman who did, including why she took on the challenge, the few exceptions she allowed to make it possible, and how it’s inspiring us to adjust our spending... and maybe even try out a ban of our own. Plus, how much should you involve your kids in the design of their rooms? We share some tips and tactics for keeping everyone happy in the process, so the result is a room that they love (and that you also like to be in with them). Plus, the paint colors that will help your home sell for more money (some of them surprised us!) and a DNA test that led to a humbling personal discovery. Be sure to check out younghouselove.com/podcast-89/ for notes, links, and photos from this episode. Doorless bathrooms? Toilets behind glass walls? Showers and tubs just sitting in the corner of the bedroom? These “open concept” bathroom trends seem to be showing up more often, and they’re alarming to some and exciting to others. So this week we attempt to understand what sparked this growing trend, and we explain where we land on the bathroom privacy spectrum. Also, Sherry concocts a new date night idea for DIY enthusiasts and John recaps how a few months off of social media has affected him (for better and for worse). Plus, how our very own half-bathroom installation went terribly, terribly wrong. Be sure to check out younghouselove.com/podcast-88/ for notes, links, and photos from this episode. It’s never fun to get a call saying that you have to tear down something that you just SPENT AN ENTIRE WEEKEND CONSTRUCTING, but that’s exactly what happened with our beach house bunk beds. So this week we’re sharing what went down behind the scenes, and what we did to get around it. Plus, we’re talking to Matt Paxton who's one of the extreme cleaning experts from the A&E show Hoarders, and he sheds a ton of light on why people hoard, how you can help someone who does, and what tricks he has picked up for keeping his own home in order. Sherry’s also diving deeper into the woo-woo waters, John’s loving a certain non-power tool, and our whole family is cracking up over a recent game-related discovery. Be sure to check out younghouselove.com/podcast-87/ for notes, links, and photos from this episode. We’re getting personal this week, and sharing some early setbacks and hard choices that almost steered our lives in a totally different direction - no houses, no blog, even no marriage! We also dive into how some failed attempts at making over a certain area of our home led to us giving up and calling in the pros. Plus, an easy way to up your drawer organization game, and a tool that makes nearly every project easier. Be sure to check out younghouselove.com/podcast-86/ for notes, links, and photos from this episode. This week John's fessing up to a design choice that he insisted we make in our beach house kitchen, but we now realize was - shall we say - misguided? Thankfully it's not too hard to undo, so we're explaining our change of heart, and what we're doing to fix it. There’s also a polarizing design “trend” that we’ve been asked to weigh in on, so this week we’re sharing our take and why we think it gets people so worked up (this trend literally can make people get rage-y). We’re also sharing some secrets for recreating that super cozy, uber luxurious bed you see in the pages of magazines... and why there are some bed-making tricks that are best left to the pros. Also, does Young House Love have a board game? Be sure to check out younghouselove.com/podcast-85/ for notes, links, and photos from this episode. We don’t always see eye-to-eye on our projects and decorating decisions. In fact, we’re stuck in the midst of some pretty "active" home arguments right now. So in honor of Valentine's Day, we're sharing everything we love about each other. Just kidding, that would be boring. We’re walking you through three of our home-related disagreements and how we’re planning to work through them - hopefully without too many hurt feelings (although Sherry's pretty heated about one of them already). We also cover a whole slew of updates, from the historic review board's verdict on our duplex roof proposal to Sherry's never-ending Invisalign saga. And most importantly, we answer one of the most common questions we get: if our neighbor still thinks Sherry is named Laura. Plus, our new favorite solution for wrangling shampoos and soap in the shower, and one of us falls hard for something shiny. Be sure to check out younghouselove.com/podcast-84/ for notes, links, and photos from this episode. We’ve encountered a few frustrating setbacks with our beach duplex renovation, but thanks to a small technicality we were finally able to charge ahead and start demolition. Gotta love a loophole! So we're sharing our work-around, and the surprising thing that was discovered during demo. Plus, when it comes to buying things online without touching or seeing them in person first, we've become much more willing to go for it these days, so we’re sharing our tips for minimizing your risk when shopping for home stuff online (including how to unlock even more reviews, and what items we haven't had the courage to buy online yet). Plus, we make the case for rethinking your shower curtain and the verdict on whether or not a weighted blanket can solve Sherry’s sleep problems. Be sure to check out younghouselove.com/podcast-83/ for notes, links, and photos from this episode. We don’t always see eye-to-eye when it comes to purchases for our home, so this week we’re sharing some strategies we’ve developed for helping the other person see things our way - whether they’re the one who is itching to buy something, or the one trying to rein it in. We also picked up a surprising trick for online shopping that has saved us over $1,500 on items for our beach house so far! Plus, how we’re making good on our goal to get outside more often, how cutting the cable cord has inspired a new kid-friendly TV option, and why you shouldn’t craft and talk on the phone at the same time (it could literally ruin the world). It may seem counterintuitive (don’t most people want to add a deck?! ), but ous is GIANT and it’s just not pulling its weight anymore. So you can find out why we think tearing it down is the way to go - and what the heck we want to put in its place on this week’s episode. We also talk with Manhattan Nest’s Daniel Kanter about which design trends are getting tired - and why older homes shouldn’t be approached in the same way as their newer counterparts. Plus John gets mushy over his favorite saw, Sherry considers the trip of a lifetime, and we can’t stop talking about a talking fish. #47: How Do You Know If It’s Your “Forever House”? #46: The New Home Habit That's Saving Us Nearly $1,000! We had an “a-ha” moment while we were away on spring break, which led to a HUGE whole-house purge (including lots and lots of toys) and a ridiculously surprising reaction from our kids. So this week we talk about what inspired the change, and how it has shaped our outlook moving forward. We also share how we got so chummy with our neighbors - and how you can foster a more social atmosphere with yours. And we learn why paying attention to house staging tips might pay off, even if you have no plans to move. Plus Sherry finds inspiration in the success story of one of her favorite accessory designers and John finds inspiration by gawking at people on the beach. Like a creeper. This week we’re sounding off on an article that says open floor plans should be a thing of the past. We’ve been known to knock down walls and widen doorways to add a more expansive feeling and better flow in all three of our homes, but there are undeniable reasons why it may NOT always be the right call. So we’re breaking down all the pros and cons of open concept living and pointing out when to avoid the urge to open up a floor plan - plus what to do if you’re struggling with the one you’ve already got. We also share a big curb appeal improvement that we tackled in just one afternoon and Sherry spills her favorite sources for extra long curtains and explains why she loves them so much. One last gripe: what’s the deal with all of those storage units popping up everywhere!? As we find ourselves in the midst of our biggest and most pocket-draining project ever, on this week's episode we’re sharing our system for planning and managing our spending during any large scale upgrade or renovation (plus we divulge a few money-saving tips along the way). We also share how some simple house updates paid off big for a friend, we learn why you shouldn’t touch someone else’s toilet paper, and we school ourselves on the correct pronunciation of “hygge.” Also, MARIGOLDS!!! In this week's episode we go behind the scenes of a home makeover show with Candis and Andy Meredith, who tell us how they got their HGTV show and what surprised them most about the process. Plus, they share their infectious affection for historic homes and give us their best tips for bringing old character to a house of any age. Sherry also talks about how she has been helping our neighbors stage their house to sell, I reveal how I managed to simplify one of our least favorite chores, and we both share how we recently saved hundreds of dollars (!!!) on a beach house update. Also, why is it SO DANG HARD to cut the cable cord?! #40: Going On Vacation For "Research"
This week we're sharing how a recent weekend getaway to a small cottage turned into a reconnaissance mission for our own vacation rental project. Plus, finding ceiling lights that look good together but aren’t too matchy can be tough. We struggled with it ourselves until we learned to rely on one simple trick for keeping our home’s light fixtures in check - without robbing them of all interest and personality. We're breaking that down this week, along with what pro decorators say guys should never have in their homes. We also herald a new painting tool that I'm obsessed with... and it turns out Sherry's really bad at something that most people can do without even trying. Guess what? Even pro house cleaners hate cleaning. So we asked YouTube cleaning guru Melissa Maker to share her secrets for making your cleaning chores faster, more effective, and all-around less painful. Plus, Sherry dives headfirst into the (often mispronounced) Danish concept of “hygge” and how it can make for a happier and cozier home. We also take a look at the wacky backstory to one of our favorite household products and an even wackier date night that had us laughing with (and at) our neighbors. In this special episode, we’re talking about the unpredictable and sometimes dramatic ways that we’ve seen the internet change in the last decade. Has social media dethroned blogging? Has sponsored content made things worse? And what has made us more guarded about opening our lives up for public consumption? In this recording of our keynote talk from Altitude Summit, we tackle all of this and more, including why a Bachelorette turned to us for advice, what we regret about a major moment in our career, and what blog comment still brings Sherry to tears. #37: To Brass... Or Not To Brass? In this episode we’re talking about what women “should” and “shouldn’t” have around the house (Sherry’s guilty of at least one!) and we’re diving deep into the question of metal finishes. Should they all match within a room? How about throughout the house? And is the brass trend over or here to stay? Plus, you guys call in with your very own random and hilarious house quirks, and we share the awesome and the cringe-worthy moments from our trip to Palm Springs. In this long overdue update on our beach house renovation, you’ll hear how we’ve got some walls going up and many others coming down - and why we’ve changed our mind on the floor plan (again!). We also revisit our master bathroom reno for a sec (which is still percolating). Plus, we talk with Oh Joy’s eponymous founder, Joy Cho, about turning a blog into a lifestyle brand - and pushing through the many rejections along the way. We're also talking about a simple upgrade that has streamlined our hall bathroom and an even simpler sticky fix that has solved a cord nuisance in our house. Oh, and Happy Valentine’s Day everyone! What should you do when a sentimental hand-me-down just doesn't fit in with the rest of your home? And if you try and try but just can’t find a way to love it, do you keep it out of guilt and give it everlasting side eye or let it go and cry because you feel heartless? We’re weighing in on that tough call most of us have to make. Also, another one of Sherry’s house schemes quickly unravels and I get real about those online “find your style” quizzes. Plus, we give an underrated kitchen accessory a moment in the spotlight, we find out what your home state smells like, and a famous “neighbor” drops us a line. This week we count down our five favorite tricks for adding flow to any space so it feels larger and less cramped. We also divulge a big financial plus for buying a beach house in such bad condition (it's saving us thousands!). Plus we explore what organizational items annoy professional organizers, and what they recommend instead. We also get some great tips from a listener who finally conquered her giant laundry pile. Oh, and John reveals some mildly creepy Facebook stalking that turned him into a self-proclaimed hero. Be sure to check out younghouselove.com/podcast for notes, links, and photos from this episode.ero. What’s it really like to downsize? We talk with House*Tweaking blogger Dana Miller about how moving to a smaller home (at a time they’re family was expanding!) helped them achieve their financial and family goals, and why it’s not always as easy as it may seem. Plus, our own pursuit to spend less money on things and more on experiences leads to a very strange morning together. Also, when should you buy vs. rent a new tool and Sherry’s favorite quick trick for dents and scratches in wood furniture. When a listener asked about the strange habits or odd things you might uncover in our house, we jumped at the chance to pull back the curtain and call each other out: from the unusual supply that John keeps in the office to the confounding items you might find sitting on our couch and in our kitchen drawers. Plus, a local realtor puts the kibosh on Sherry’s fantasy bathroom renovation and John shares a popular home robot that sadly didn’t live up to our expectations. We didn’t find love in a hopeless place, but we found a beach house color in a surprising one. Yes, several weeks, multiple test swatches, and 1,500 comments later, we’ve finally settled on a color for our beach house’s exterior - and the decision came from one of the most random places! Plus, we talk to blogger, designer, and Domino contributor Jenny Komenda about the challenges of running a design business and what decor trends she’s noticing in the new year. Plus, we’re digging some weird stuff this week. We’ll just leave it at that. We asked you to call in with your house-related resolutions for 2017, and boy did you guys deliver! In this episode we play some of our favorite listener voicemails and share what home-related changes we’re hoping to implement in the coming year. Plus, we share why we were giving all of the presents under the tree some serious side eye on the night before Christmas, how we found something burning in our son’s bedroom, and we take a look at what trends Pinterest is projecting will be big in 2017. #26: Are You Sitting Down? We’ve Got Big News. #23: Mo House, Mo Problems? #21: How The Heck Do We DIY With Kids Around?